A night mode is on the way to Twitter. 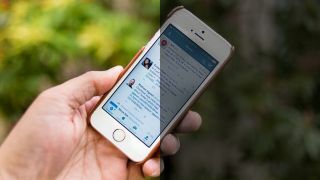 It seems like everyone loves a night mode at the moment: iOS has just added one, Android's engineers are thinking about adding one, and now Twitter is playing with the idea in the very early alpha builds of its official app on Android. The last thing you want when you're doing some late-night timeline browsing is to strain your eyes with all that blue light, after all. 9to5Google reports that the feature automatically activates itself based on the time of day wherever you happen to be. When in night mode, Twitter swaps out the familiar white background for a dark blue color. There's also a Material Design overhaul in the pipeline for Twitter which should roll out to everyone in the coming months. We've seen a night mode get added to and then dropped from the various Android N developer previews that have appeared so far. In the latest one it's missing, but Google has left the option for individual apps to activate the mode themselves. If you've got no idea what we're talking about, some scientists think that the blue light emitted by our electronic devices can have a detrimental effect on our sleep patterns. The new Night Shift feature added to iOS and third-party apps like f.lux are designed to add a warmer glow to screens before bedtime. How long it will take for the feature to reach the masses remains to be seen. As for Android N, it's due to arrive in the autumn, probably alongside new Nexus devices.